Slime-san was minding his own business, sliming around in a peaceful forest when suddenly…A giant worm appeared and gobbled him up! Now deep within the worm’s belly, Slime-san has to face a decision: Be digested by the incoming wall of stomach acid… Or jump, slide and slime his way through the worms intestines and back out its mouth! Slime-san is made by Fabraz and published by Headup Games. 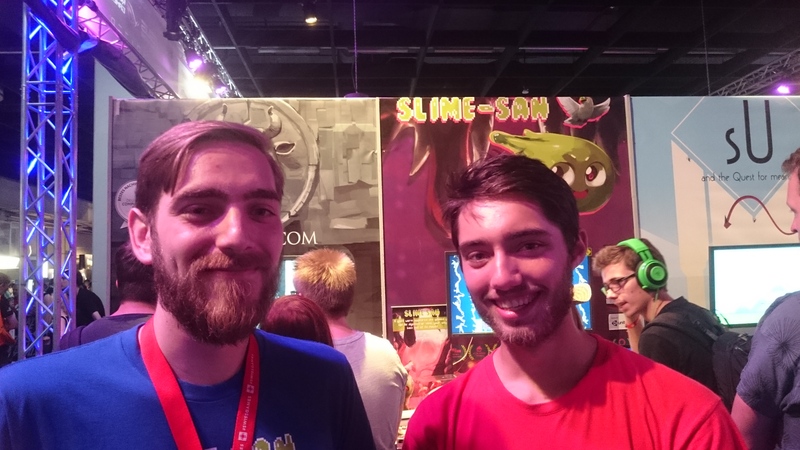 Slime-San was also present at the Indie Arena Booth during Gamescom 2017 and we had the chance to pass by the booth and talk to Ben Miller about the game and what has changed with its development since the last time saw it at Gamescom 2016. Before I could go on asking questions about the game or anything else, one of the players that were at the booth playing, stopped playing and came to tell Ben how much he loved their game. Not only that, but it was quite interesting to hear a random person say their thoughts on the game, so we engaged in a bigger conversation that ended up making the interview even more interesting. The “random player” also gave us his name, Gilian de Berk, for the purpose of writing this interview. Thank you for that Gilian. So Gilian expressed his emotions about the game, saying he really liked the build-up that the stages have in the game and how they become progressively difficult in a fair way. “I am not a good platformer player but the different mechanics in the game made it interesting for me to explore it,” said Gilian with Ben answering him that this is what of the things that the development team meant to do with the game in the first place. Adding different mechanics that allow to traverse each stage as fast or as slow as you want in different ways. There is of course a timer that is running out, but nonetheless, each player approaches problems and obstacles in a different manner because of the mechanics within the game. “We wanted to let people be as inventive as they can with it,” explained Ben. Gilian then said he actually became interested in the game when he saw the trailer for it during one of the presentations that Nintendo did for Switch. Ben explained how much the whole team freaked out (in happiness) when they saw that video and how it was a “dream come true” for them. Thank you again for your contribution to this interview Gilian, we really appreciate it! Ben also told us that the game had a very successful beta with even some speedrunners trying out the game and apparently making the devs “feel bad” about how bad they are at playing their own game compared to how some of the testers played it. “The beta period definitely allowed us to make the game more accessible,” said Ben. The game is developed in Unity, making the game quite easy to port to other consoles and the team is already preparing to bring it to Xbox One and PlayStation 4. There was also quite recently a DLC released for it. Regarding future plans, Ben told us that they are already working on prototypes for a new game, with more being revealed near December of this year. More info about the game can be found through its Steam page and website.